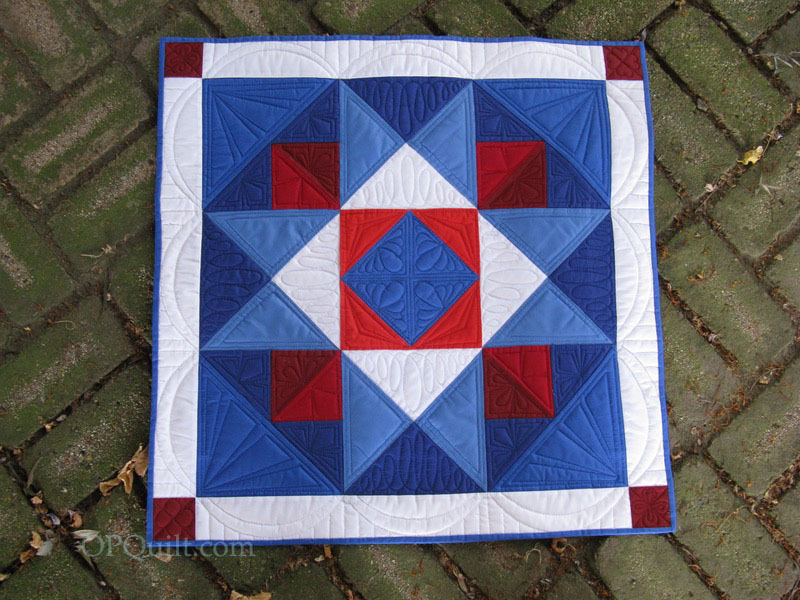 Red, White, and Blue Star | OccasionalPiece--Quilt! What a fun mini and yes, perfect for celebrating the 4th of July! Painter’s Palette is all you describe and more and I’ll be happy when more LQS’ start carrying it. For the last 30 years, DH and I are most likely to view great fireworks along the east coast of North Carolina. It is a special treat to see the “light show” on display one beach at a time, running north to south–Morehead City to Atlantic Beach to Emerald Isle, nothing better! Like many activities at the beach, it is always clear that the crowds of families have been coming and watching for years, generations, and I love that continuity and sense of tradition. Hope your 4th is lovely! I love fireworks, the colors, the sounds, the ah’s from the crowd, the smiles and cheers, the excitement, the hope it gives for our country! Just dropping in to tell you how lovely your mini is- very patriotic indeed! We Aussies are not too big on fireworks although I do love them when I’ve had a chance to see them! I love fireworks! It is so much fun trying to guess what design will show up when the shells explode. Every year they seem to come up with so many different combinations and designs. I remember laying on a quilt at a local park, watching them go off overhead when I was little. One of my favorite memories! The colors of fireworks are pretty. I can’t stand the noise or the smell. So watching at a good distant is the best. Yes, I do like firework displays. The most memorial one was at Disney World with my grandchildren. I love the 4th of July! My husband Don and I had our first date at the fireworks display in Canton, NY. I had 2 boys who were part of our date. It was 52 degrees and started to rain and thunder before the first fireworks went off. We all got soaked running back to the car, but the rest is history! Don adopted the boys and we will have been married 37 years in August. I adore fireworks. Those big aerial displays thrill me every single time. My most memorable fireworks is the year I missed them. It was 1959 and I was about 6 1/2. It was a Saturday morning and I was anxiously awaiting seeing the fireworks that night, which were set off on the other side of the lake in the town in Oklahoma where we lived. I was an only child, and about mid morning, my parents gave me the news that we would not be going to see the fireworks because, through a private adoption, my new baby brother, 10 days old, would be arriving later in the afternoon. So exciting. I just love fireworks. Bright burst of color for just a few seconds, and then it’s gone! It’s magical any time. Looks like a fun block to make. Thanks for the opportunity. Love fire works especially with little kids. They make really fun for adults. Fourth of July is a favorite time for our family. Last year we got to watch fireworks from San Clemente’s beach. The fireworks were shot from the pier and it made an awesome reflection in the water. Your table topper is festive and perfect for this time of year. I live near Washington DC, and have been down to the big show three times. I love ooohing and aaahing with the crowd. The different types of fireworks they blast is huge, and there’s nothing better than watching the fireworks with the Washington Monument in the background. 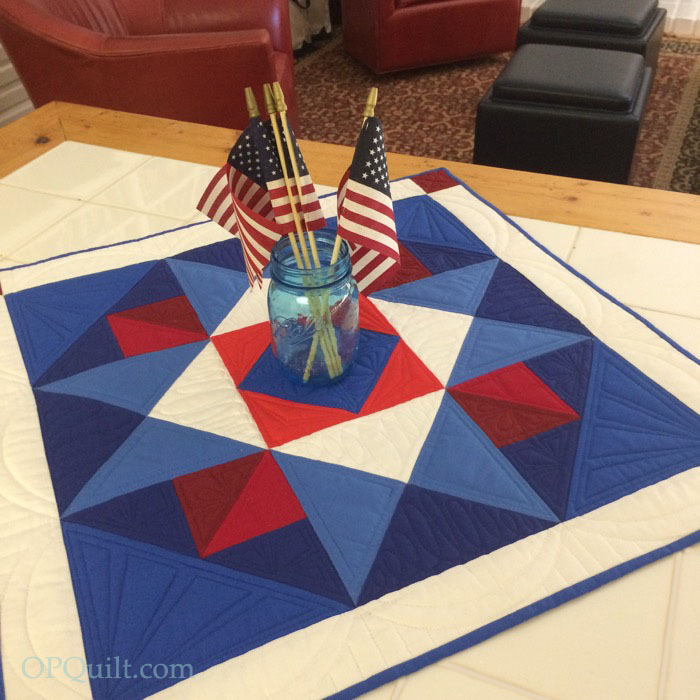 Such a beautiful table topper and the quilting is magnificent! I’m an early “fireworks” baby and have always loved those lights in the sky. My favorite is the “Grand Finale” when they shoot up so many you don’t know where to look! Thanks for a great tutorial. I like how you laid out the colors for your quilt. It turned out lovely. I do enjoy the fireworks, but the best part is everyone being together, picnics, parks, eating, and relaxing on the special day leading up to them. I live in the country near a resort area in Wisconsin. On the 4th of July, quite a few of the hotels have fire works which if you are in the right spot your can watch most of them. There is a fantastic spot by one hotel, who has a fantastic fire works display, and we go to in our 1960 MGA to watch them. Top down in the car, and the fireworks seem to be right overhead. They even seem like them are coming down on top of you. Then there is the noise from them that is unbelievable as is echos through the woods. It is fantastic! Beautiful use of shading in your mini quilt. I love the big fireworks displays, especially when they can be seen over water, and the grande finale with lots of them going off at once. Love your mini quilt! I really enjoy fireworks and for the last several years I don’t have to leave home to see them. A neighbor has started having a very large display for their family and grandkids. I can sit on my front porch and enjoy also! I was a Huntington Beach kid, but I spent my first six years in Anaheim, back in the mid 1960’s. My favorite fireworks memories are of the summer nights when all of the kids on my block were allowed to stay outside, playing together, until after the magical moments when we would stop in awed silence, watching the Disneyland fireworks light up the sky. Once the light show had ended, each child knew to go home, and there was no complaining, very little dawdling. No parental nagging was required. It was almost as if the fireworks had sprinkled fairy dust on us, making us all a bit more obedient than usual. Only Disney could work such magic. I love fireworks. My favorite time was when my husband and daughter were playing in our community band and played patriotic songs during the fireworks. Love to watch fireworks but mostly have to see tv broadcasts of them now. Thank you for sharing such a detailed tutorial of your project. I love fireworks! My parents own a campground in MT and the Canadians come down to shoot off tons. Some of my favorite memories are sitting on the playground on the 4th watching fireworks while a haze drifts over the creek. ☺Thanks for the chance to win! I’d love to try these and although I live at the bottom of the globe I do have a us postal address!!!! Here in Texas, we love fireworks, we always go early to save a seat. We enjoy the huge fireworks in our hometown of Pensacola. It is out over the bay and is beautiful. The most amazing fireworks I have seen were not on the 4th of July. They take place every Spring during ‘Thunder over Louisville (KY). They have the fireworks set off from barges on both banks of the Ohio and fireworks go off on both sides of the bridge, mirror image) over the river. Absolutely a must-see!! Love the patriotic pack of colors. I have never tried this company’s product and would love the opportunity. Your tabletopper is marvelous. My husband and I had our first date watching fireworks on the fourth of July (many years ago!) so fireworks are special for that reason. We saw some really good ones one year while visiting Salt Lake City on the fourth. Disneyworld also puts on a great fireworks show. I never cease to be awed by fireworks. I had been living in San Francisco as a student for a few years and a friend came to visit over the 4 th holiday. We went to see the fireworks and his excitement of seeing them released over the Golden Gate Bridge helped me appreciate just how special my new home was! i love the big round blue and green ones. I love fireworks! Especially the unique ones Disney uses in their parks. ooh and aah’s for fireworks! They are so fun and we recently were lucky enough to see Disney’s fireworks with our whole family….fantastic family time!! I look forward to the colors, lights, bangs and explosions of stars in the night sky. I even don’t mind being outside in the hot Arizona weather to watch them every year. rozz01 at cox dot net. We enjoy being with family and friends at the community park on the Fourth for a picnic and fireworks. Thanks for the great block and tutorial! Cute table topper. We love watching fireworks with family at the lake. 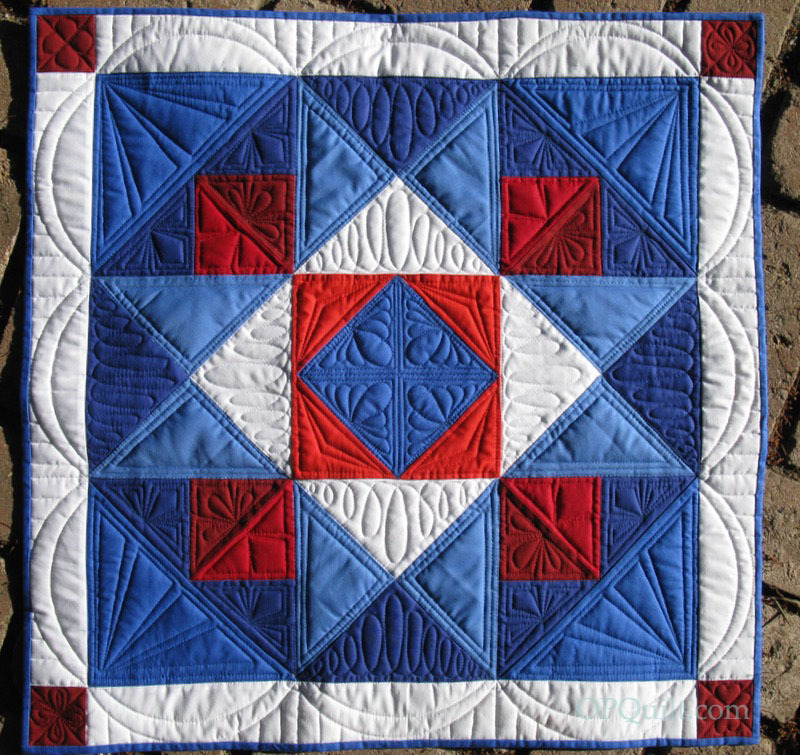 Awesome quilting on your beautiful mini quilt. I especially love the fireworks that boom loud and then crackle. Best 4th was sitting up against the buildings at the fairgrounds watching the fireworks, My boyfriend and I were so close we had to stay up against the buildings so we didn’t get hit by the pieces that were falling. I have never been so close to the fireworks, breathtaking. What a delightful little quilt. Your quilting is spectacular! I have never used Painter’s Palette Solids and I don’t know that I have seen them in any LQS around me. As for fireworks, the memorable displays are actually those my husband and I took our daughters to when we vacationed on Drummond Island (Michigan) each July 4th. Everyone gathered in the parking lot of the small elementary school, getting there early for the best parking spot. The fireworks were fired off the hill, so we never saw the people lighting the fuses, but the glorious colors in the sky above were met with ooohs and aaahs galore. The finale was always the best consisting of 5 minutes of non-stop colors, sparkle and LOUD booms! I love your block and the quilting is fabulous! Thank you for the tutorial. I do like fireworks – I love the Detroit Freedom Festival fireworks the best on the Det River viewing from the Canadian or USA side! thanks! I love your mini and your detailed instructions. Oh, how I do love fireworks….the big round fluffy ones that seem to spiral and awe me forever until the next one puffs up. I do love the fireworks with their hefty booms that accompany them. We have a hilltop where we can watch three different shows around us. I love this little piece. 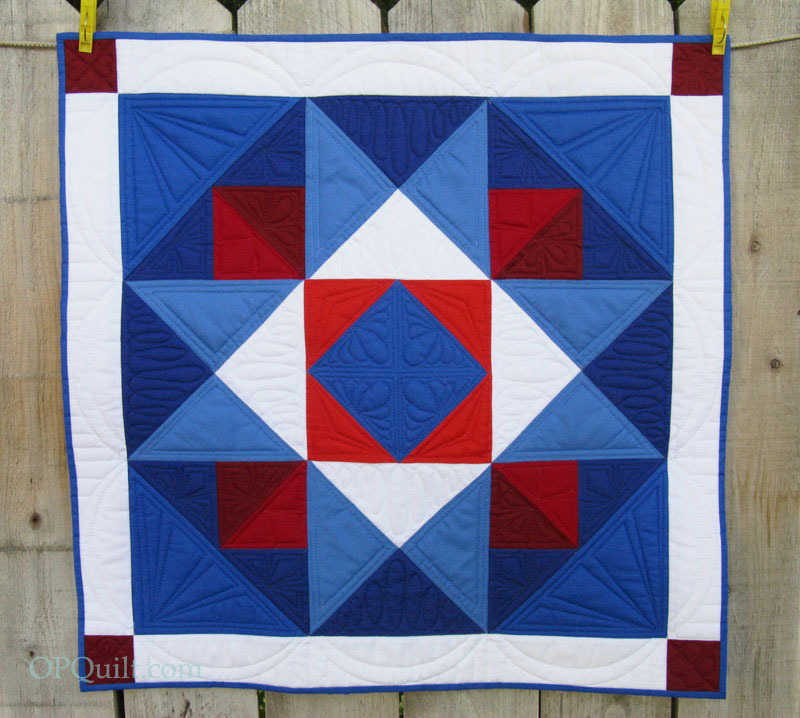 Of course, the fabrics and colors are fantastic, but your quilting is just gorgeous. The swag around the borders is perfect. Thanks for the tutorial. Hello Elizabeth! I love fireworks as they seem to bring unity…….brings out the families, friends and everyone’s smiles. Thank you for sharing your Star Block and your creatitivity. Congrats on your retirement from teaching and the occasional piecing and quilting and inspiration! I do enjoy fireworks, but from afar. The noise gives me a severe headache. I enjoy them because of the safety they provide in our community. Far to many people start fires by the misuse of fireworks and with the cities putting on these huge displays it helps to limit people from buying them. I do like fireworks but am very respectful of them; when I was younger & viewing fireworks, one of the first rockets landed in the stockpile & they all exploded at once. A few people were injured & it could have been much worse. I love fireworks that are displayed at the formal celebration put on by my city. I am not a fan of fireworks set off in an unsupervised setting. I love fireworks….even the elaborate displays from New York on tv!! Thank you ! Your mini is wonderful… your quilting sublime!! I love fireworks! I would love to go see a big city display – our hometown lasts only 20 minutes! Fireworks are so vibrant! My most memorable are from living in Amsterdam NL on New Year’s Eve. The fireworks started at midnoc and lasted an hour. They were shooting from rooftops in different areas of the city. It was a WOW event. Love teh quilting on your table topper. It looks very do-able for the intermediate quilter. LOVE THIS TABLE TOPPER!!! OUR FAMILY LOVES FIREWORKS DISPLAYS! THANKS FOR SHARING!